Ce sujet a 1 réponse, 2 participants et a été mis à jour par Andreas Brandl, il y a 1 an et 1 mois. Actual more and more WLAN devices like Power Plug exist. Wlan Devices are not supported by Pulse-Station or Imperihome. For my solution I use a PowerPlug, which can be used with the “Smart Life” App. The “Smart Life”-App can be implemented in IFTTT as an THEN-Tree. If you want: save this as a manually run blocky scene and use it on its own. 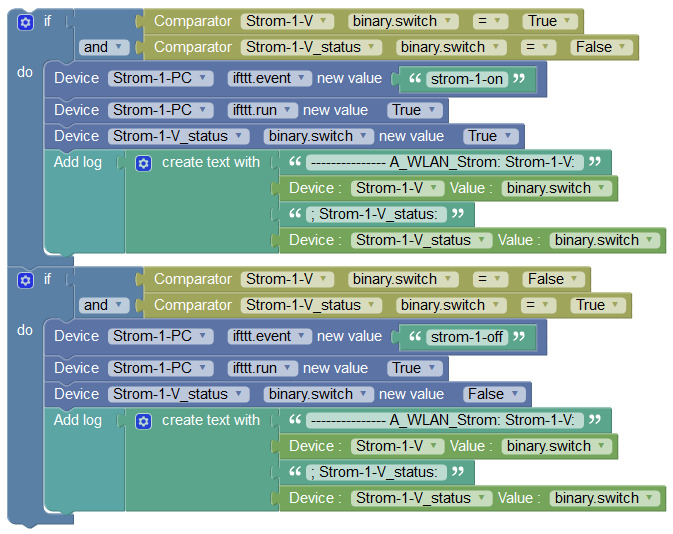 There aren`t any buttons for WLAN devices so we have to use Virtual Binary Switches. If you make 1 scene (Step 10), the reaction starts the next cycle of the scenes. After my Pulse-Station crashed several times, I think there is a bug in the IFTTT Service (but cannont confirm it 100%).